Dragon Island Slot is 15 paylines and 5 reels online video slot game presented by NetEnt. This slot is surrounded by dangerous dragons and it looks beautiful. This slot is all about island paradise, for which minimum and maximum coins per line ranges from 1 to 10. It means a player can play this slot using minimum or maximum coins per line. He game offers a jackpot of 2500 coins to the players and coin sizes are from 0.01 to 0.5. Return of player percentage (RTP) is 96.7%. 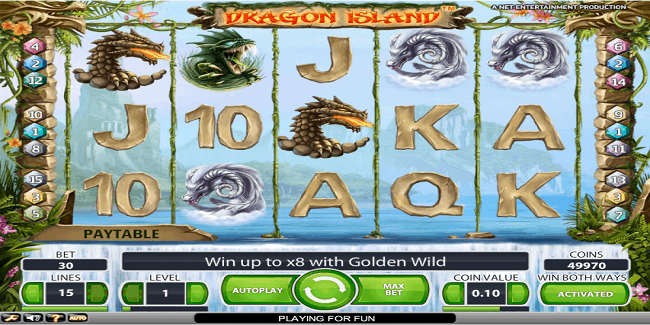 One can play Dragon Island Slot at any NetEnt based online casinos. To play the game according to your plan, you should adjust coin sizes or coins per line. “Coin value’ is the button which can be used to choose a players coin denomination and ‘lines’option is used to pick the number of active paylines. ‘Level’ option can be used to add or substract coins on every active payline and “Win Both ways’ button will activate or deactivate right to left pays. Max Bet: Spin at a bet of 10 coins on all 15 lines with right-to-left pays on. Autoplay: To play the game continuously without any interruption. Volcanoes are the scatter symbol here and if you hit 3 or more of these signs, you would trigger free spin feature. Dragon Island is an online slot which features top bonuses as well. Golden wilds symbol will multiply your winnings to x2 to x8.